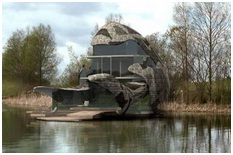 Is Glass the Key to Eco Friendly Dream Homes? Architectural designs of ‘dream homes’ are becoming increasingly ambitious and innovative with large glazed surfaces now regularly used to create impressive architectural impact. Traditionally people have associated large glass areas with energy inefficiency and chilly interiors, but as technology develops, people are recognising that glass is not only aesthetically pleasing but can provide homeowners or architects with a number of energy saving benefits. As we discover more about changing climate conditions, the design process of new buildings is far more focused on environmental considerations – often using intelligent glazing systems as a tool to increase energy efficiency. The Orchid House in the Cotswolds, is an excellent example of innovative architectural design, featuring both vast glass windows and an underground geothermal heating pump, the building manages to generate more energy than it consumes. Pilkington energiKare™ is a glazing systems that provides insulation solutions for most domestic properties by reducing the heat lost through windows. 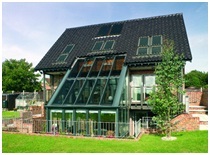 A Pilkington energiKare™ unit incorporates two panes of glass. Pilkington K Glass™ which is a low-emissivity glass as the inner pane, featuring a coating that helps reflect heat back into the room, combined with Pilkington Optiwhite™ as the outer pane, an ultra clear glass, allowing more free heat from the sun to pass through the glass. This process is known as solar gain. Pilkington energiKare™, which is more effective than single glazing or standard double glazing, helps improve a home’s energy-efficiency – reducing the amount of energy used and therefore helping to reduce heating bills. The benefits of glass are not only limited to thermal insulation – eco-build homes now commonly feature solar panels, which help produce cleaner more renewable energy. Solar panels, which are easy to maintain, after an initial investment, are cost-efficient, helping homeowners to reduce energy bills long term. 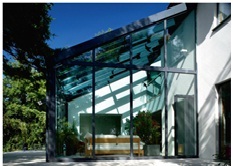 The Pilkington Solar control Glass range, has a wide variety of products – perfect for installation in new builds or to enhance the energy efficiency of your existing home. Solar control glass can be an attractive feature of a building whilst at the same time minimising, or even eliminating the need for an air conditioning system, therefore reducing running costs of most commercial and some domestic buildings. If you are interested in transforming your property into an eco friendly dream home or you are planning a new eco-build, please visit our official website and explore our products pages and find out how your property could potentially benefit from incorporating glass.